This luxuriously rustic, quiet, modern, private log cottage overlooks beautiful Green Lake through a stand of 200-year old oak trees and a private park. A breezy twelve-minute walk or half-minute drive (your choice) to Interlochen Center for the Arts further intimates your stay with international arts and entertainment and summer campers from around the world. Also just minutes away are Crystal Mountain, Traverse City, Sleeping Bear Dunes, Grand Traverse Bay, Arcadia Bluffs, Lake Michigan Beaches, antique shopping, cherry orchards, canoeing and river-rafting, wineries, and several casinos. Additional recreational pleasures abound; swim, boat (you can moor your own boat outside our cottage or use our canoe and small kayak between May and October), windsurf (we also provide a windsurfer), fish, ice-fish, run, hike, bike, bird-watch (Green Lake is famous for migratory birds), cross-country ski, grill with our Weber, roast marshmallows on an open fire, or just relax inside with music and a good book or watch a movie by our fireplace (many books and movies provided). Our fully-furnished, two-story log cottage is finished inside and out in knotty pine, and features a large master bedroom with rustic cedar bedroom set and private bath on the second floor, a loft with two twin beds, a second bedroom and bath on the first floor, and sleeper sofa in the annex. The cottage also features an LCD TV, gas fireplace, wireless internet service, beautiful rustic living room furniture in the great room and an unusual rustic dining room set. A full-service kitchen and laundry room with washer and dryer are also provided. ONE SMALL or MEDIUM size dog allowed ONLY with advance approval. We're sorry, but NO SMOKING is allowed. Since 1995, we have been an 'Interlochen Family'. We looked for a perfect place to buy for years until we finally found our 'dream' cottage on Green Lake, one mile from Interlochen in 2002. We love sharing our home with other Interlochen families, and with folks simply interested in exploring the arts and the lake, all year round! We LOVE Interlochen and we love sharing it with family, friends and guests! For those who love a good reason to jump in the lake, well, you're 80 feet away. Baths on both floors - downstairs offers tub with shower....master bath has shower only. This cabin was perfect. Beautifully appointed and situated across from a pretty peaceful lake. Nearby to all conveniences. I highly recommend and will stay here again. We loved our stay. Cabbin is very comfortable, clean and well equipped. Lovely quiet area. We easily traveled to Crystal Mountain to ski and Traverse city for a night out. Very clean, well furnished, full of northwoods style, great beds! I went here with a buddy for a fishing trip. We couldn’t have been more pleased! Very quiet, comfortable, and well appointed. It’s 5 minutes from restaurants in Interlochen ( go to Maddie’s!) and 15-20 to t city. There is a tempur pedic mattress on the top suite and it's Very comf. This would be great for a family any time of the year. Lake access is < a 5 minute walk. I will return to be sure! 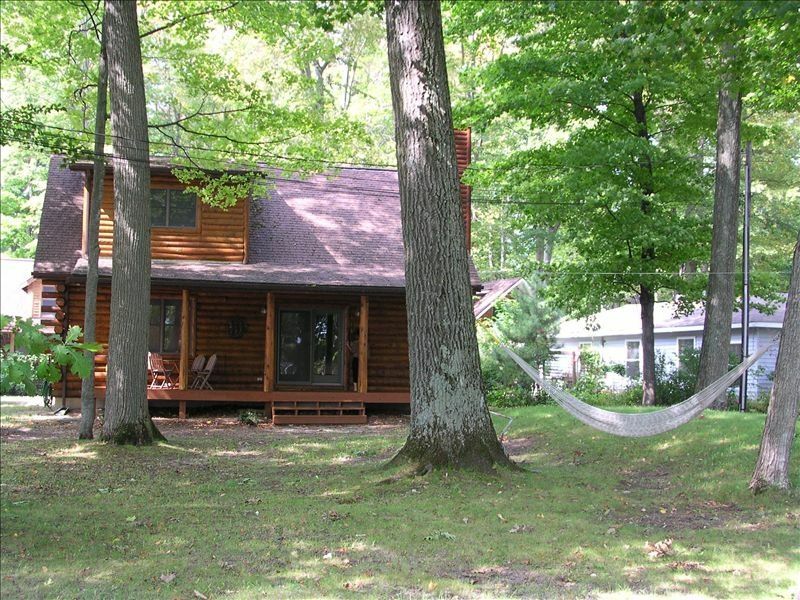 Relaxing and comfortable log home in beautiful Interlochen. Gorgeous views of Green Lake. Beautiful log home with amazing views of Green Lake. Amenities are well-provided and the place is spotless! Probably one of the most comfortable cottages we've stayed in....right down to the stone fireplace and creative wood furnishings. Loved our visit to Interlochen Center for the Arts, where we were campers ourselves many years earlier. The drive to Gwen Frostig's Studio, The Alpaca Boutique and Sleeping Bear Dunes was beautiful with the last of the fall colors this weekend. We also loved eating in town at the Hofbrau. Totally recommend this place and we cannot wait to come back again for another visit. Thanks Chris for your hospitality! Perfect location and all the comforts we needed. A very cozy cottage with all the comforts of home. The location is easily accessible to the Leelanau Penninsula and Traverse City. We spent our days exploring the area and were happy to return to a warm comfy cabin to relax. The cabin was lovely! The owners thought of everything to make our stay comfortable & enjoyable! Everything was wonderful beyond words!!! Through mid-May 2018, the rate is $135/nightly plus a $75 cleaning fee. (additional $75 fee if you have a dog) SUMMER RENTALS BY THE WEEK ONLY. Three day minimum required Sept-mid/May. All taxes INCLUDED in these rates. Thank you!